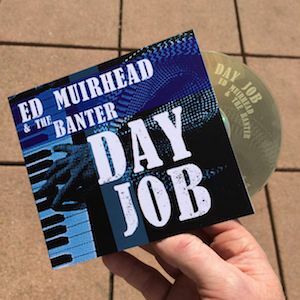 Day Job - an album by Ed Muirhead & The Banter on Tattie Records. Original roots and blues songs with an East-of-Scotland twist. "High Girders throws down a glove to anyone who says that the blues are passé; in fact it's a thumping tune in the vein of its earliest incarnations that suddenly sounds terribly novel." Have you ever heard someone say, "Don't give up the day job"? Day Job is the new album from Ed Muirhead & The Banter*, with songs about life, love, work and walking the dog. These are original roots & blues with a twist from the east coast of Scotland. This is the album Ed began two years ago, when he went into the studio with a book full of songs . . . however, the vibe in that session turned out more acoustic folk than blues - leading to Simple Life in 2013 (the blues album stayed on the back burner meantime). Ed's dream was to swap his day job in engineering for music therapy - a powerful way to help people communicate and heal through music . . . and this provided the title track "Day Job". The dream becomes reality in 2015, as he begins two years of intensive music therapy training. Meantime he's built this album of songs, with hints of Stevie Wonder and The White Stripes - and a limited run of CDs in handmade cases. * The Banter - a few musical Dundee friends Ed brought in to help bring Day Job to life! Inspired by a certain comedy sketch: "I'm only here for the banter . . ."